By January 2019, Search Ads became available for use in 13 more countries (you can check the complete list of available countries and regions here) on the Apple App Store. 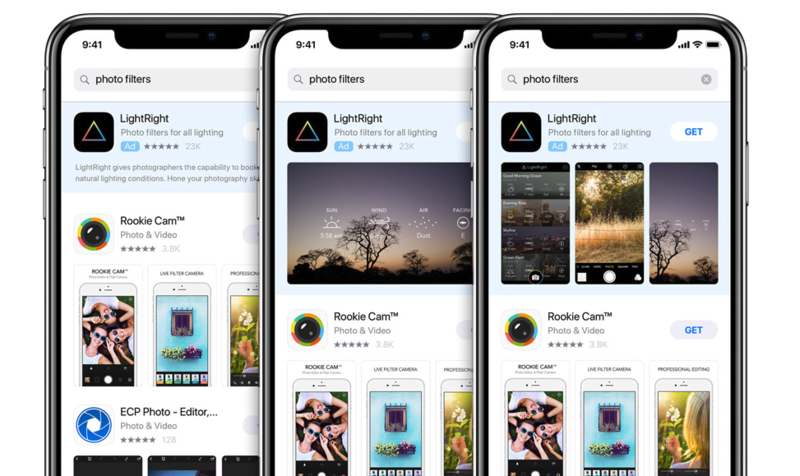 Apple's official advertising tool offers the option to choose and research keywords, refine the audience, use creative assets and schedule the ads, which is an invaluable asset for developers and publishers who also look at metrics to understand how to improve the performance of their titles. Here at Lab Cave, we're specialized in mobile growth strategies, especially ASO and Mediation - we were also one of the first companies in Spain to get the Apple Certification on Search Ads. We are going to share with you some tips for your Search Ads campaign in the Apple Store. You'll learn how to optimize your keywords, how to choose and categorize your target audience and how to analyze the results to progressively improve your campaigns. 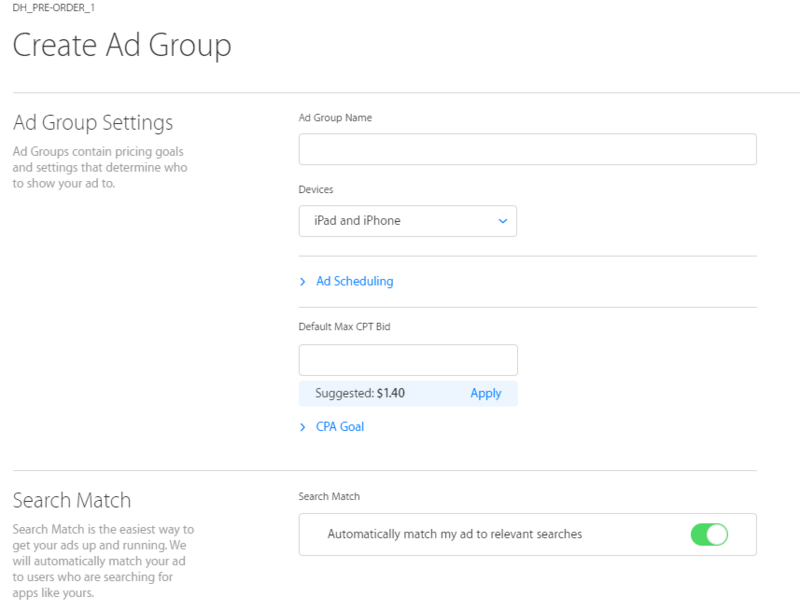 To create a Search Ads campaign, you have to set up your Ad Groups. 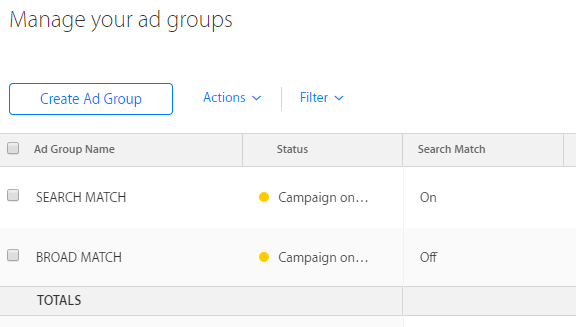 For each Ad Group, you are allowed to choose one Match Type: Search Match, Broad Match or Exact Match, they are all available in Search Ads Advanced. The number of Ad Groups per campaign depends on what the goal of the campaign is: for User Acquisition, we recommend you set up one Ad Group for each of the Match Types available.
. Timely promotions. For example, in clothing sales, flash offers on a selection of summer products.
. User return or reopening: for when your goal is the reuse of an already installed App and the increase of its average session time. Attracting users from within your ecosystem: for when you want your existing App users to download and install another App your company has developed.
. A mix of the previous examples. Search Match: For this Ad Group, you don't need a keywords list, so you can leave the "search match" option checked. Apple will search for the most relevant keywords related to your App. In the analysis stage, you have to confirm which keywords were useful so you can add them to the Ad Group and also, which keywords weren't so you can include them in the 'negative keywords list'. 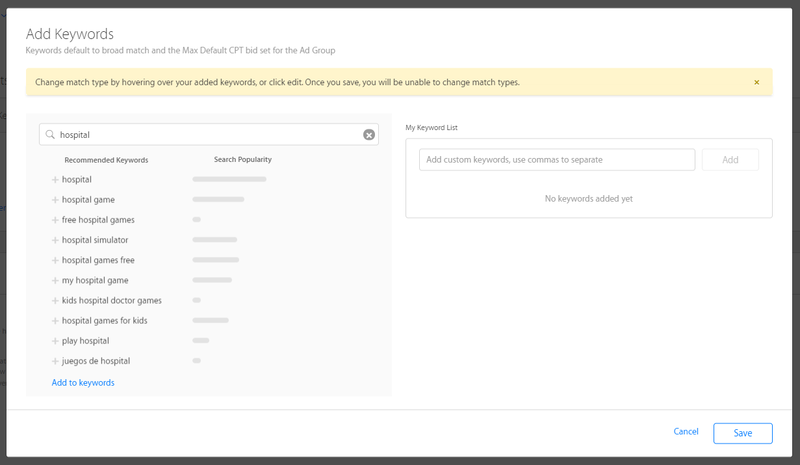 Broad Match: After running the Search Match Ad Group for a while, you will have a list of keywords. Use this list to pick the best keywords to be placed on the Broad Match group and then create a new catalog. The keywords that aren't useful should be marked as negative, to avoid generating combinations with them throughout your campaign. Exact Match: In this Ad Group, the "Search Match" option must be deactivated and this time you need to add the exact keywords you want your App to appear for in the searches. It's helpful to add some misspelled keywords that have traffic or to really delimit your interests (for example, define "Call of Duty" as a good keyword, but with "Call of Duty Black Ops III" as a bad keyword - and put it in the negative keywords list). Each Ad Group has its own graphics and offers the possibility of data comparisons. This makes it easier to evaluate the performance of the campaign and to make adjustments: if this campaign doesn't have a deadline, we recommend you take a look at the set up Ad Groups every three months to make sure that they are optimized, this way you'll have a big chunk of data to base your decisions on. "A standard campaign - active 24 hours a day, for one week - could amount to a huge budget spend if not planned properly"
We encourage you to think about the geographic area that the Ad is going to be active in and to program your campaigns accordingly. Once you choose strategic dates and only spend money on your top countries, you can expect better traffic in the App Store. Also, pay attention when you upload your campaign creatives because so far, it is not possible to rearrange the order of screenshots. Thanks to Search Ads characteristics, this ongoing process of testing and optimizing can be done on real user behavior of the iOS ecosystem. It will make things easier and more accurate. But in the end, you must not forget that Search Ads is a compliment for standard App Store Optimization (ASO). It allows you to broaden or narrow the search terms your App appears for. The better the original ASO is, the less you'll have to complement it and the less you will be spending on Search Ads. It's an all too common and expensive mistake to invest in a basic ASO and then try to improve it via Search Ads campaigns. By optimizing the main keywords of your App, you lower the average amount the keyword bid will cost. Also, it will be easier to appear in those desired term searches. In order to get the most out it, an efficient ASO strategy based on research, analysis and periodic updates is a must. We hope you can take advantage of these tips to create your Ad Groups in a more effective way and we wish you good luck in your marketing journey.